Every so often there is a groundswell of demand from the rally fraternity for another Round Australia Trial. Although these events are relatively expensive to compete in because of the time and distance involved, the negatives are gradually overcome by the desire to get into the outback, experience some automotive adventure and meet the challenge of an event that takes people outside their comfort zone. I have always wanted to see the Round Australia Trial tradition continue. Having competed in three, the 1964 Ampol Trial, the 1970 Ampol Trial and the 1979 Repco Reliability Trial, I would love to add to that tally. Alas, although lots of people want an event to happen, no one is prepared to do anything about it. So, having been drawn in to organising the 1995 Mobil 1 Trial under similar circumstances, I again made the considerable effort so that others may enjoy the Round Australia experience. Hence the Red Centre to Gold Coast Trial was born. I recruited the organising team that had so successfully run the 1995 Mobil 1 Trial. Tom Snooks, Philip Bernadou and Michael Browning. They were willing to do it again, as were other key personnel including scorer Garry Searle, key organiser Phil Rainer and many others. This is the best rally organising team available in Australia, without doubt. The idea for the Red Centre to Gold Coast Trial came about when it was announced that Rally Australia, our country’s world rally championship heat, would be held on the Gold Coast in 2008. It seemed fitting to run an outback Trial style event for classic rally cars in the lead up to Rally Australia, finishing at the WRC event and allowing competitors in the Trial to see the world cars in action. Rally Australia officials offered the opportunity for Trial cars to compete on the Rally Australia stages on the Saturday of the event and other benefits. 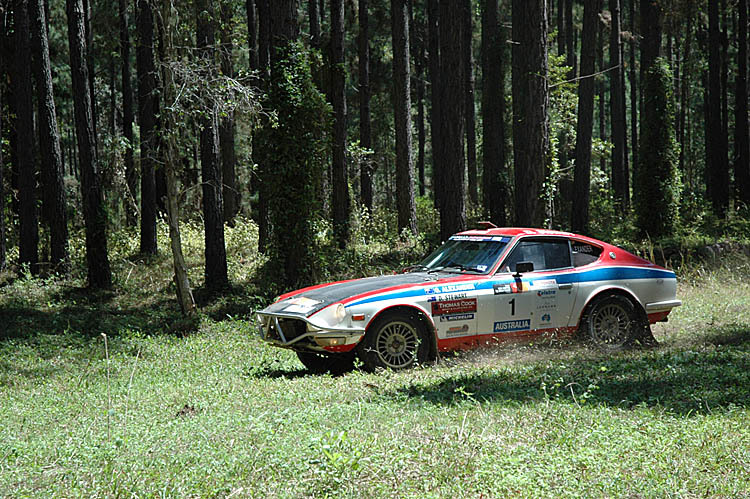 Then Rally Australia was postponed for at least twelve months. We polled our 80 entrants as to whether this would affect their plans to compete in the Red Centre to Gold Coast Trial. Unanimously they wanted to proceed with the Trial. This demonstrated to the organisers that outback trialling is what the competitors want. 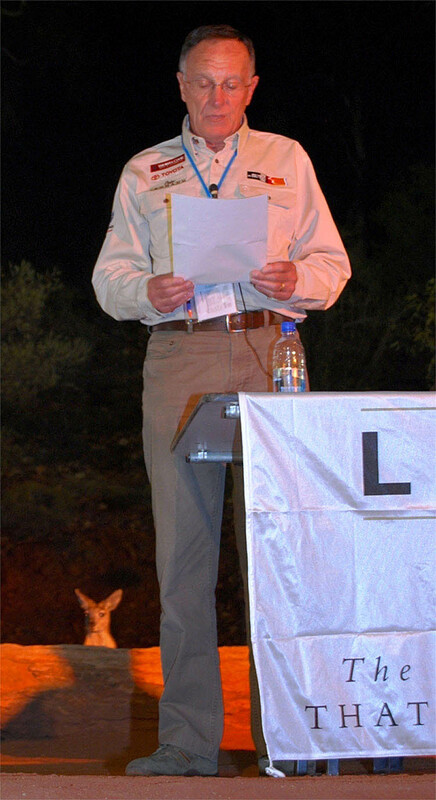 We were proud to be associated with outback health organization Frontier Services. We agreed that Frontier Services be our charity partner for the event, which gave them opportunities to raise their profile through our media coverage, and organise. The 7500 km event lived up to the traditions of its predecessors, being tough and tiring. There were 70 starters, including two East African crews who were keen to try their East African Safari skills in Australia. Starting in Alice Springs, the course did a loop on Day 1 back to Alice, using some sections of the very rough Finke Desert Race track. Many drivers tackled this track too enthusiastically and suffered car damage as a result. Day 2 was a long run to Mount Isa via the Plenty Highway, with several rough but scenic rally stages en route. A dusty section on the outskirts of Mount Isa in the dark stripped points from most of the field. From Mount Isa the course headed north via the vast Lady Annie copper mine complex with several typical stages through the rugged ranges. A six hour rest brake at Normanton gave crews some respite before heading east to Cairns with a mixture of rough and smooth stages to a welcome overnight rest. From Cairns the course to Townsville included three superb smooth and fast forestry stages through lush tropical , a contrast to the barren and rocky roads in the Mount Isa area. The scenic coastal journey was not to last, the field heading west again to Longreach via the Burdekin dam catchment area and the longest competitive stage of the event at 96 kms. Rain in the Longreach area caused the cancellation of one stage en route to Birdsville via Windorah, another long and tiring day. The reward was a great outdoor dinner at Birdsville catered for by Dusty Miller, the Birdsville baker, who served his signature dish, curried camel. Very nice it was too. The home journey commenced from Birdsville, with a two day run to Bourke via Innamincka and Tibooburra, with some nice stages in the sandy undulating country around Innamincka. After a six hour break and the world’s toughest steaks at Tibooburra, several great stages on cattle properties took the field to Bourke for another night of rest. The penultimate leg to Goondiwindi travelled via more property stages with a quick lunch stop at Lightning Ridge to refresh the tired crews. By now most were just looking to reach the finish on the Gold Coast. The final leg was a fairly straightforward run the Broadbeach via the Goondiwindi Off Road track for an interesting section, and then the final, traditional “Fat Lady Sings” stage near Boonah. 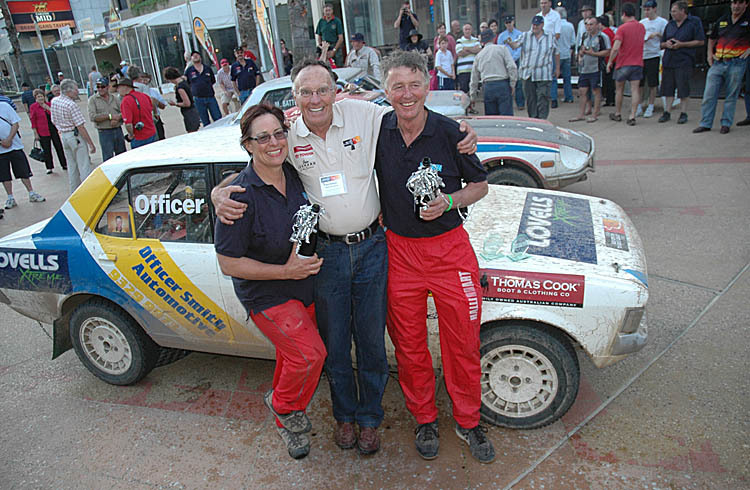 The event was won by David and Kate Officer, former Australia champions, who drove a well prepared Mitsubishi Galant (purchased for $50 some years earlier) and led virtually from start to finish. Second was vastly experienced Geelong driver Graeme Alexander with David in a Datsun 240Z, and third former NSW champion Mike Batten co-driven by Steuart Snooks. Although not a full Round Australia event, the Red Centre to Gold Coast Trial served to give the competitors a good taste of what the earlier events had been like.